The 2015 Grand Prix will start on 2/8 at the Papa Gino's in Waltham. Arthur R. Longwell, a USCF life member from Worcester, Massachusetts died of cancer on Dec. 9, 2014. He was 74. He was born March 18, 1940 in Worcester, the son of Arthur I. and Gladys E. (Mahan) Longwell, and had lived here all his life. He graduated from Worcester South High School and Worcester State Teachers College, where he earned both bachelor's and master's degrees. 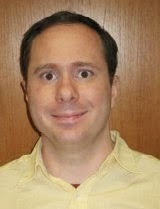 Mr. Longwell taught science and mathematics in the Worcester public schools, primarily at North High School. He retired in 2001. He was a member of the Massachusetts State Retired Teachers Association and had served in the U.S. National Guard. An avid tennis player, Mr. Longwell was a member of the Worcester Tennis Club. He competed in many tournaments throughout New England and was twice ranked first in New England - once for men's doubles and once for mixed doubles. His other love was chess. He was a longtime member of the Worcester Chess Club and a life member of the Massachusetts Chess Association (MACA). Besides his mother, living in Worcester, he leaves his wife of 54 years, Marianne (Joudrey) Longwell; a son, Arthur R. Longwell Jr and his wife Robin of Rutland, Mass. ; a daughter, Lisa A. Ludwig and her husband Lawrence of Salem, New Hampshire; two brothers, Ronald I. Longwell of Ballston Lake, New York and Malcolm H. Longwell of Oxford, Mass. ; two sisters, Joan M. Beauchemin of Marlborough, Mass., and Susan J. Longwell of Rutland, Mass. ; two grandsons, several nephews and nieces. A funeral service was held Dec. 12 in Hadwen Park Congregational Church in Worcester, followed by burial in Hope Cemetery in the city. Prize winners at the Harry Nelson Pillsbury Memorial, held December 14th in Marlborough, Mass. The tournament was directed by Bob Messenger and George Mirijanian. 12/13 6:33PM: Final adv. list updated (as of 6:08PM). Adv. entries for Pillsbury Memorial (as of 12/11 7:34PM):http://goo.gl/d5l2H9. Prize winners at the 3rd Spiegel Cup Qualifier, held December 7th in Marlborough, Mass. 12/5/2014: Q3 Adv. Entries Published! TW: updated again (as of 11/05 4:11PM). Q3 advance entries (as of 11/04 7:23PM) available here: http://goo.gl/nLHVm7. After the 11.30 Papa Gino's tournament in Waltham, Advait Natti is the winner of the Grand Prix 2014! Congratulations! Advait secured first place after winning his 4th round game against Eli Richmond, who was second in Grand Prix points. Eli Richmond and Aidan Duncan also secured trophies this year. The next tournament (and the last one this year) will be the 6th NESSP Scholastic Chess Tournament on 12.21 in Chelmsford. Please go to MACA's Events page for more information. Prize winning teams at the Fall Team Tournament, held November 23rd in Boxborough, MA. It is with great sadness that we report that longtime MACA and USCF member Martin Laine of Lunenburg, MA passed away at home recently. He was 64. Martin had also been a longtime member of the Wachusett Chess Club in Fitchburg and one of the hosts of the monthly Chess Chat programs seen monthly (5 times a week) on Fitchburg Access Television (FATV). Prize winners at the 2nd Spiegel Cup Qualifier, held November 9th in Marlborough. The tournament was directed by George Mirijanian, Steve Frymer, Donna Alarie and Bob Messenger. [11/08 5:56 PM] Final List as of 11/08 2:56 PM updated. [11/07 4:11 PM] List as of 11/07 3/46 PM updated. Advance Entries for Second State Championship/Spiegel Cup Qualifier [as of 11/06 9:17 PM] available now: http://goo.gl/8qyxSd. 11/6/2014: MACA is back on Twitter! The Massachusetts Chess Association is pleased to announce the re-launch of MACA's Twitter handle (@MassChess). We want to give chess players another channel to easily connect and collaborate with MACA and other members. Tweet us your comments, questions or pictures of your chess activities with the hashtag #MassChess! Be sure to follow @MassChess on Twitter and stay tuned for more. Also don't forget to Like our Facebook Page. News submitted by: Edward Chiu, MACA Promotions Committee Chair. Prize winners at the 81st Greater Boston Open, held October 26th in Marlborough, Mass. The Grand Prix special prize has been set by Dmitry Barash at 3 trophies at the end of 2014 for the sum of the 10 best results (accumulated points) in Scholastic tournaments run by Matt Gosselin during calendar year 2014 (Burger King, Papa Gino's, NESSP). Eli continues the tense race with Advait. The next tournament is on 11.30. Prize winners at the First Spiegel Cup Qualifier, held October 19th in Marlborough, Mass. The tournament was directed by Bob Messenger, George Mirijanian, Steve Frymer, Dmitry Barash, and John Sadoff. Final Adv. Entries for Q1 [as of 10/18/14 1:30PM] posted:http://goo.gl/0xmI48. Adv. Entries for Q1 [as of 10/17/14 6:58PM] posted: http://goo.gl/0xmI48. For updates on SCS standings please check MACA's 2015 SCS Standing Page. The Massachusetts Chess Association is proud to announce the 2014-2015 Spiegel Cup season. The top 5 players by the March rating supplement, winners of the 4 MACA Qualifiers and the player who accumulates the most points in the Spiegel Cup Series will make up the field of 10 players in each age group. This will mark the 2nd year that the Spiegel Cup Series (SCS) will determine the final entrant in the Spiegel Cup Finals. We are very excited for the number of affiliates returning to organize SCS events. The first SCS event will take place this Sunday (9/14) at the Waltham Papa Ginos. For more information please click here. With her Round 1 victory over GM Alexander Ivanov at the New England Open in Leominster on Saturday 8/30/14, Carissa Yip broke Judit Polgar's record of becoming the youngest girl in the world to defeat a grandmaster. Judit Polgar beat her first GM - Lev Gutman - when she was 11 in 1987 at the SWIFT Tournament in Brussels, Belgium. Carissa accomplished her feat at age 10, and GM Alexander Ivanov was her victim. 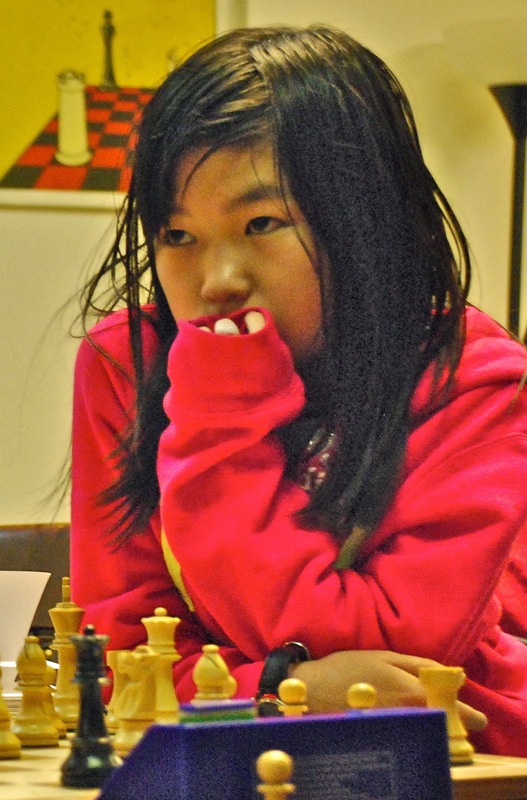 The USCF has confirmed that Carissa is the youngest girl in the USA to have ever defeated a GM in USCF-rated play. 1st-2nd: Scott Didham (1994) of Sharon, MA and James Apiri (1815) of Worcester, MA, both 5-1. Top U1850: Howard Goldowsky (1834) of Canton, MA and Joseph Bennett (1793) of Hubbardston, MA, 4-2. 1st: FM Denys Shmelov (2579) of Pepperell, MA 9-1. 2nd: Sherif Khater (2208) of Nashua, NH 7.5-2.5. The tournament was directed by Bob Messenger, George Mirijanian, Steve Frymer and Nicholas Sterling. FINAL NEO Adv. Entries (as of 08/29 05:30 PM) updated:http://goo.gl/iUvXZb. NEO Adv. Entries (as of 08/28 09:21 PM) updated: http://goo.gl/iUvXZb. NEO Adv. Entries (as of 08/27 09:08 PM) updated: http://goo.gl/iUvXZb. NEO Adv. Entries (as of 08/25 11:24 PM) updated: http://goo.gl/iUvXZb. NEO Adv. Entries (as of 08/26 07:38 PM) updated: http://goo.gl/iUvXZb. 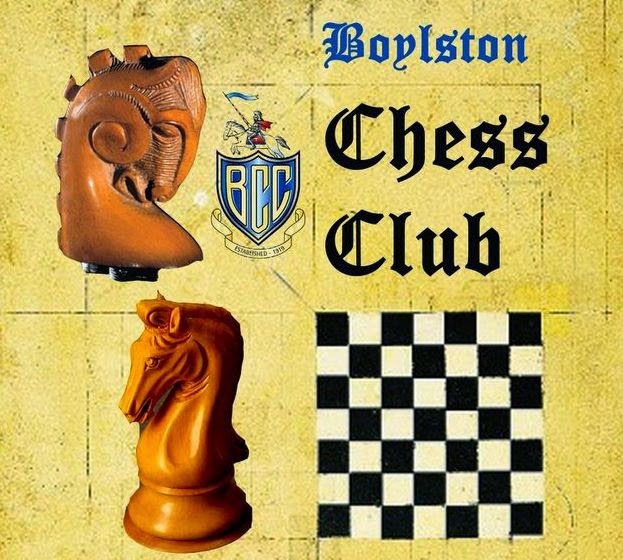 The Boylston Chess Club is looking for a new home. Please join the discussion on September 3 as one of the nation's oldest chess clubs discusses its future. The Massachusetts Chess Association Board of Directors is pleased to announce committee members and coordinators for the 2014-2015 term. This was one of the most successful tournaments thus far that I have run at NESA. We had 14 players altogether - a decent result considering we were up against the mighty Continental Open. Most of the players here were ones who have played in other major USCF and MACA events, so I was pleased to see NESA's chess tournament scene finally elevated into the mainstream. Most importantly, this was the first tournament for which I successfully awarded Gold, Silver, and Bronze medals for the two-day combined results, as well as certificates for the individual days. NESA and I warmly thank all the participants and appreciate everyone's patience with getting these results published. Pictures are posted on MACA's Facebook page on the created NESA August G/30 event page. Our next tournament, in honor of National Chess Day, is a two-day G/30 d5 (4-R each day) on 10/11-10/12/14. We look forward to seeing you over the board at NESA. Next tournament is on 8.24 in Chelmsford. The MCA will again be hosting the US Cadet Championship this year. This is an invitational for the top under-16 players in the US. This year we have expanded the field to 10 players. The tournament starts July 19th at the Rockville Hilton and the games will be broadcast live at http://uscadet.mdchess.com. The winner receives a scholarship to UMBC and the top three receive free entry to the Washington International. The full field is below. Congratulations to Denys Shmelov and Mika Brattain for earning International Master norms at the World Open in Arlington, Virginia July 2nd-6th. This is Denys's third IM norm and Mika's first. This article includes an upset victory by IM Sam Sevian of MA. Please find below the Final Standings of the Concord-Carlisle Scholastic June G/30 d5, the inaugural tournament of the new Concord-Carlisle Chess Club. Abundant thanks to everyone who participated. We will make sure to have enough time for the next tournament to have four full G/30 d5 rounds, and to be Adult rather than Scholastic. The standings are also posted on the MACA Facebook page and my Blog. We look forward to our next class and tournament in the fall with great anticipation. Much appreciation. The first MACA meeting of this new board will begin at 3:00 P.M. on Sunday, June 22nd at the Boylston Chess Club in Somerville. Prize winners at the New England Junior Open, held June 8th in Chelmsford, Mass. The tournament was organized by Kavyashree Mallanna for Celestial Minds. Bob Messenger was the chief tournament director. Prize winners at the 83rd Massachusetts Open, held May 24-26, 2014 in Marlborough, Mass. The tournament was directed by Bob Messenger, George Mirijanian, Steve Frymer, Nathan Smolensky and Nicholas Sterling. Non-binding referendum question: "Would you support electronic voting for future elections?" Tellers were: Election Commission (Stephen Dann, chairman; George Mirijanian, Walter Driscoll) assisted by Arthur Barlas and Joanne Driscoll. The Election Commission has received more than 100 sealed ballot envelopes as of Thurs, May 22. Please do not mail any more, but you can bring these, sealed in the return envelopes to the Mass. Open in Marlboro by Saturday at noon. More than one ballot can be sealed into each envelope. The EC thanks those who mailed ballots from across New England and beyond, and, will begin counting unsealing these at noon on Saturday, and counting in the TD room of the Mass Open at the Best Western Royal Plaza Hotel in Marlboro. Ballots will be counted three times due to the contested officer and board positions this year. About 10 ballots were returned as undeliverable (as of Thursday), and, we will post a list of members/former members for which we are seeking new addresses. Ties for board positions will be settled as in the bylaws with a vote at the June board meeting. We are also compiling a listing of "open" and "sought" volunteer positions to be announced soon. This includes volunteers who wish to learn how to be USCF-rated tournament directors, those to help in publicity, education, as well as open chairs and coordinators. There are also staff vacancies for Chess Horizons, and we are always looking for hosts for our open and scholastic events not already scheduled at a hotel. If you receive, or have received, the following piece of SPAM mail from a potential customer for chess lessons, DO NOT RESPOND TO IT. The writer of this e-mail is a known perpetrator of e-mail fraud based on this appeal to find a chess coach in a foreign country. Simply delete it and pay it no further heed. > How are you doing today and I hope you're fine? > time. Hopefully an arrangement can be made. The 880 MACA 2014-15 paper ballots were finally mailed first class to all MACA member (of record on 2-28-14 as per bylaws) on May 8, 2014. The two sheets included the officer candidates, board at large candidates, a non-binding referendum on electronic voting and a ballot return envelope. As the PDF's were prepared to include detailed return instructions by commission member George Mirijanian, it wasn't noticed that the return information was not included when these PDFs were sent directly to the printer in Leominster. Because this chair took a last look at these PDFs, we came to conclusion that a label was needed on the outer envelope to inform everyone that detailed instructions would be put online, along with the candidate statements, pretty much identical with the mailed package. This operation, done largely by volunteers, still costs MACA nearly $1,000 due to the increased postal costs, ballot printing and two sets of envelopes plus four sets of mailing/message/return address labels. The board governs MACA, and should not be confused with "tournament directors" who also are largely MACA volunteers, but govern USCF-rated tournaments, not the everyday services of your state chapter of USCF. It is hoped that everyone will endeavor to return their ballot, and, allow the entire membership to "weigh in" on a non-binding referendum to make future elections as democratic while enabling everyone to preserve their option to vote. The MACA annual membership meeting has for decades not been the election "site," but has long been the first public announcement of the election results. You have until May 23 to make sure we receive your ballot by mail, or until 12 noon, at the Mass. Open in Marlboro to return it sealed in person in Marlboro. Ties in the election are covered in the bylaws as are the full responsibilities of the Election Commission from December to May. Ballots from family members MAY be returned in one envelope, as was done in previous years. All ballot envelopes received before noon on May 24 will remain sealed until counting begins in public at 12:01 p.m. in Marlboro. You have until roughly May 14 to let the commission know that you DID NOT receive a ballot or ballot return envelope, or, any other discrepancy, like not telling us that you have moved and left a forwarding address. We have a LABEL IMAGE of every single label produced and any address changes received between March 1 and May 8. We appreciate any address changes for anyone, including those who now do not receive Chess Horizons. We will triple check the counts (in public) for every single office and write-in and validate every single ballot (see ballot instructions that follow). Note that this is the FIRST contested election for the board of directors in a number of years, and, the first where I have been the chair of this commission, and the three of us are veteran volunteers in many past elections. We have already made dozens of decisions based on the MACA bylaws (see these on this website) in this six-month process that evolved back from before we received 501-c-3 nonprofit status from the federal government in 1980. MACA is currently the most democratic of all USCF state chapters in this process and your participation is sought to keep this tradition alive. Currently, we are mailing ballots to members age 5 to 90+, and, it is the only communication that is now mailed to every single member for which we have a mailing address. Some two dozen MACA members do not receive ballots due to lack of a current address being on file, living outside the USA, or personal preference. We also believe that probably one third of our membership either has no e-mail address, or we do not have a current, accurate one for whatever reason, many of these being our youngest and oldest (life) members. There is no reason why you can't include comments and ideas (not on ballot! ), but please don't include MA Open entries, membership money or donations in the ballot envelope. Remember, vote for just one candidate for each office, and up to 8 directors at large in order to not invalidate your ballot. Watch for a Volunteer Coordinator report to learn more about the Association's volunteer needs, as MACA, Inc., has no paid/salaried workers. Any other materials you may receive this month are by candidates, not by the MACA board of directors, aside from renewal notices and promotional flyers for upcoming events. USCF requires voters to register in advance, and does not allow voting before age 16. There have been many proposals to change MACA's procedures, not just the general non-binding referendum. The EC just carries out the wishes of the board to the tune of the bylaws and MACA standing rules. Thanks to everyone who participated in our NESA May G/30 this past Saturday. An especially loud shout-out, and congratulations, to our new player Srikanth Rapaka, who visited us from Northboro and held off all comers to take First Prize. We hope we will have more players at our next event so that I will be able to give away higher prizes. In the near future we will start organizing new team competitions. Any players interested in team competitions should contact me so that we can start forming the teams and setting the dates. Looking forward to having a big crowd of chess players at our next NESA event. See you all soon. position will not be counted. the box next to the write-in. 3. If you write in the name of a person, please print the name clearly. B. The second part of the ballot is where you may vote for the Board of Directors. You may vote for up to eight (8) candidates for director. 1. If you vote for more than eight (8) candidates, then none of your votes for Director will be counted. cannot be more than eight (8). 3. If you write in any candidates, you must mark an "X" in each corresponding box for your vote to be counted. A. You may return your ballot by U.S. mail in the envelope provided. Ballots returned by U.S. mail must be received no later than Friday, May 23, 2014. B. You may return you ballot in person to the Elections Commissioner or a member of the Elections Commission at the site of the 83rd Massachusetts Open Championship at the Best Western Royal Plaza Hotel, Marlborough, no later than 11:59 a.m. on Saturday, May 24, 2014. C. All ballots must be returned in the envelope provided, whether returned by U.S. mail or delivered in person. Ballots not returned in the envelope provided will not be counted. D. Ballots will be opened and counted in public view at the site of the 83rd Massachusetts Open Championship on Saturday, May 24, 2014. “Since being elected MACA president one year ago, I have worked passionately towards helping this organization fulfill its complex goal of supporting chess in the Commonwealth in all of its forms. With experience as a tournament director and a teacher in afterschool programs, and being a frequent player myself, I appreciate the many important functions MACA serves, from running tournaments for both children and adults, to supporting our brightest young talents as they travel to tournaments abroad, to reaching out to potential new players young and old. “I was an integral part of launching our Early Education Initiative, an exciting and innovative new program which aims to get chess into the schools at a rate not seen before in this state. I have worked as editor of Chess Horizons, to personally ensure that the organization provide the beloved magazine to its loyal subscribers, as it is our duty to. I also made sure that we delivered proper reimbursement for missed issues prior to my term. “Hello fellow member. You support Chess in Massachusetts. You play OTB chess in rated tournaments. You pay money to MACA and USCF. You teach your children and friends the moves and rules. Chess is worthwhile and you want others to enjoy chess. Only you can create more chessplayers. Teach and play chess in your town at libraries, senior and community centers, retirement homes, Scout and Girl Guide meetings, anywhere people meet for a few hours. Thank you for any efforts to grow chess in Massachusetts Only you give chess to the next generation. Can MACA do anything to help? “Now MACA supports chess for a few. TWO persons, almost alone, run a dozen rated tournaments and do little more. Does MACA’s train TD’s? Does MACA help Chess Clubs, or r Coaches and Trainers, or Professional level players? Does MACA teach chess and provide playing opportunities to 1,051836 persons aged 5-17 in Massachusetts? 125 turn out for a MACA event. Do three million MA adults play? 1200 are USCF members but does MACA ask their help? Is MACA a joke? MACA is in crisis. “I have been MACA’s Treasurer since 2001 and have been Membership Secretary, Chairman of the Tournament and Budget Committees and chief director at MACA tournaments for the last several years. “I think it’s extremely important for MACA’s money to be kept in responsible hands. MACA should avoid risky investments such as the ones suggested by my opponent. For example, in March 2013 he advised the MACA board to invest in Southern Copper Corp. (SCCO), saying that his broker had said that copper was going to be big that year. At the time SCCO was selling for about $40 a share, and it’s currently selling for about $30 a share. The point isn’t just that a particular investment wouldn’t have done well but that MACA should be using its money to promote chess and provide services for its members, not to play the market. “The MACA board needs to move beyond the personal conflicts which have driven away volunteers. MACA should focus on maintaining its current programs and finding new ways to promote chess in Massachusetts. “Board Member for thirteen years, including two terms as President (2001-2002 and 2012-2013), Clerk (2005-2006), and Publications Coordinator/Chairman (three terms). I was a member of Metrowest and Boylston Chess Clubs. I served as Boylston Chess Club Board Member for several years, including a term as Clerk, and a Club Tournament Director. I am a Bridgewater State College graduate (political science major, history minor). “As former MACA President, I reported the problem that remains, that MACA lacks an appropriate investment portfolio. Over $40,000 sits in bank accounts earning on tenth of one percent (0.10%) interest. The board has blocked investing, voted down my motions for an investment committee and to join Scottrade, and did not second my motion to buy 250 shares of Southern Copper Corp. (SCCO paid a dividend of 10.52%). In contrast to the current hands off approach, I am planning for MACA to have a balanced portfolio consisting of stocks, bonds, and local stocks and municipal bonds. “I have been a member of the MACA Board, including one-time President, for almost 15 years. My participation brings civility, reasonability and an objective perspective to MACA proceedings. Incumbents Steven Frymer and George Mirijanian declined to make comments. “FIDE Master, Former MACA President, former Chess Horizons Editor, current Boylston Chess Foundation Board member, and tournament director, particularly active in running scholastic events. Andrew Liu of Westborough attended the 2014 National Junior High (K-9) Championship in Atlanta, GA last weekend (April 24-27). He was co-champion with Vignesh Panchanatham of California, but took the 2nd place trophy on tiebreak. He also won the National Junior High Blitz championship at the same tournament. This is not Andrew’s first national championship. Last summer he represented Massachusetts in the Barber Tournament of K-8 Champions in Madison, WI, a prestigious event recognizing K-8 State Champions. He took first place among 50 players, including eight national masters. He was also champion in the U15 section of the 2013 US Junior Open. Prize winners at the 24th Massachusetts G/60 Championship, held April 27th in Marlborough, Mass. Bob Messenger and Steve Frymer directed. The 24th Mass G/60 Championship online registration will be closed midnight tonight! Adv. Entries are published here: http://goo.gl/5T3vtY. The following teams and players won prizes at the Hurvitz Cup, held April 13th in Boxborough, Mass. The Hurvitz Cup is the Massachusetts scholastic team championship. The tournament was directed by Bob Messenger, assisted by George Mirijanian, Nathan Smolensky, Steve Frymer, Maryanne Reilly, and Chris Chase. The list is published here. Thank you all who came to participate in the NESA April G/30 One-Fund Benefit last weekend 4/5-4/6/2014. Apologies for the delay of this notice; it took some time to calculate how much $$$ we would donate to One-Fund. The final total is $130, including $30 from T-shirts and $100 from my matching donation to the fee revenue. Our next NESA Tournament is tentatively scheduled for Saturday 5/10/14, 1:30-5:30 PM, 4-Round Swiss, G/30 d5. Prize winners at the Gus Gosselin Grade Championship, held March 9th in Marlborough, Mass. The tournament was directed by Bob Messenger, Chris Bird, George Mirijanian and Steve Frymer. The Adv. Entries for the Gus Gosselin MA Grade Championship is available now: click here for the GGG adv. entry list. Tied players are listed in tiebreak order. Players finishing 1st or tied for 1st are state champions for their age group. Adv. entries for the 2014 Spiegel Cup State Championship available here. Attention MACA members of all ages, potential members and those who might wish to join/rejoin! MACA's annual election of officers and board of directors at large will "kick off" on Feb. 15, 2014, with the deadline for nominations for the 4 officers and 8 at large directors to the MACA Election Commission (Stephen Dann, chair; George Mirijanian and Walter Driscoll). Anyone wishing to vote (be sent a ballot) must be a MACA member (Life, adult, junior) by Feb. 28, 2014, both dates stipulated by the MACA bylaws. Ballots with any "campaign statements" will be mailed in early April, and ballots will be counted in public view at the Mass. Open on May 24, 2014 in Marlboro, and reported at the annual MACA meeting at 9 a.m. on May 26, 2014, also in Marlboro, MA. Anyone who runs for the 12-member board of directors MUST update their MACA membership to run through June, 2015, as per the MACA bylaws. Candidates will have at least until 3-1-14 to prepare 100-word statements for the ballots (200 if running for one of the 4 offices), or to decline any nomination that is sent in to the Election Commission by 11:59 p.m. on Feb. 15, 2014, and this 3-1-14 deadline may be extended, but not the date to send in nominations or self-nominations. There is no age restriction to vote or run for the board, but minors (under age 18) should have the confirmation of a parent for a nomination for office or director as MACA is incorporated in MA (since 1954), and is a 501-c-3 federal non-profit organization under the IRS (since 1980). You don't have to be a member of the MACA board of directors to be a volunteer with the Association, the state chapter of the U.S. Chess Federation for 75 years. Currently, all officers and board members are volunteers, and empowering group to authorize spending for the Association. Please read the MACA bylaws, or contact the current officers, coordinators and committee chairs to find out volunteer opportunities within the Association. MACA currently is seeking volunteers (may include an expense stipend) to serve the Association in such capacities as Chess Horizons Editor, and to chair committees starting in June, 2014 to May, 2015, following the Mass. Open. Those wishing to view the extensive MACA annual financial reports should contact the MACA Treasurer, and/or view the monthly board meeting reports by the MACA Clerk. This is my first opportunity to be the chair of the Election Commission, and I hope to get feedback from anyone in the membership as to interest in serving the Association as a volunteer in 2014-15. George Mirijanian is also the new publications coordinator, seeking to find a new Chess Horizons (state publication since 1969) editor, and, Walter Driscoll rounds out the Election Commission, which has pledged NOT to run for MACA office during this upcoming year. We prefer nominations in writing (in person, mail or e-mail) or a confirmation in writing if there is a phone call, rather than "conditional nominations" and we will confirm any that we receive within the Election Commission. Note that the new MACA fiscal year is from May 1 to April 30, so that there will be a true annual report (not 10 months) presented at the annual meeting on May 26. Thanks to everyone who has made MACA one of the outstanding state chess associations for at least the past 50 or so years. We very much urge you to make sure your home/mailing address and CURRENT PREFERRED E-MAIL ADDRESS is known to MACA, through Bob Messenger, the membership secretary and data processing coordinator, as the board has authorized no further mailings except for the ballots themselves by MACA. Election ballot details may be modified at the scheduled Feb. 16, 2014 meeting of the MACA Board of Directors, so, watch for such changes and this comission's report before March 1. Prize winners at the Winter Team Challenge, held February 1st in Marlborough, Mass. Spiegel Cup invitation lists for 14U, 11U and 8U. Invited players should send their confirmation to Steve Frymer [sfrymer (at) rcn (dot) com]. If an invited player is not coming please contact Steve Frymer immediately [781-862-3799]. Alternate players should inform Steve Frymer whether they are presently available to substitute for an invited player. who is present at the hotel will be invited in. he/she is at risk of being replaced. Confirmations should be received no later than midnight 31 January. Thank you all abundantly who contributed to the 3rd annual Chess Education Expo organized by Massachusetts Chess Association this past weekend at the Hyatt Harborside Hotel. The Expo took a great deal of effort to plan and assemble over the past three months, and I appreciate everyone's assistance enormously. I have been catching up on some other urgent non-chess projects for the last few days that had to be put aside for the Expo and then frantically rushed to be completed afterward, so that is why this letter of gratitude is a bit tardy. 1. First, hearty thanks to the Hyatt Hotel and Kendra, the Convention Manager, for providing us such a wonderful locale for the Expo. The view lived up to its superlative reputation, and the thunderstorm we got to watch against the Boston skyline was tremendously exciting. We commend the efficiency of the staff in helping us out, the superb cuisine at the nearby Harborside Grill, and the care that was taken to keep valuable possessions in the room secure. I will soon be posting photographs on MACA's Facebook page. 2. Second, let me thank Nathan Smolensky, President of MACA, and Stephen Dann and George Mirijanian, Directors of MACA, for manning the room for extended hours; and Bob Messenger, Treasurer of MACA who was also a Tournament Director of the Boston Chess Congress, for helping us spread the word through some marvelously improvised publicity. Apparently the Expo had over 50 visitors on Sunday after its light attendance (around 20 stragglers) on Saturday. 3. And finally, I thank Sharon Burtman for coming on Sunday to deliver her presentation on educating children in chess such as to inspire them for life. I am sorry I could not be there in person, but I understand there was a large and appreciative crowd. The Education Committee of MACA will review the Expo, ups and downs, and make plans for our next event. We understand and regret the short notice of some invitations that unfortunately prevented some of you (and others not contacted here) from attending who might have done so. We also wish to be better organized about consignment of book vendors in the future to avoid the last-minute frenetic scramble - and drop-outs - that preceded this event. This Expo was the first one I came to and oversaw as Education Chair. In my mind, it was still in its pilot stage. I myself would like to expand the Expo's appeal next year to have many more lectures, vendors, chess education experts, software and website developers, and other invaluable and often overlooked providers of chess education on hand. All of us deserve to receive recognition and have all of our combined service become far more conspicuous and appreciable for the chess-playing public. In particular, parents of up-and-coming Scholastic players of noteworthy ability should be much more attuned to the tools out there. Naturally, all of this will require far superior advance planning and organization than was in place this year, and I pledge to make that happen. If any of you would like to be involved in, and informed about, future chess educational events, please write back to confirm and we will keep you apprised of developments. On behalf of MACA and the Education Committee, I thank everyone for a successful Expo and look forward to having all of you, and many others, at our next, hopefully even better, Expo. At the beginning of the new year, Massachusetts Chess Association, in conjunction with the Boston Chess Congress held on the weekend of 1/10/14-1/12/14, is hosting its third annual Education Expo. The Expo is the brainchild of the MACA Education Committee, and its aim is to showcase, through displays, lectures, and demonstrations, successful projects, literature, software, and other instructional programs that have contributed, and will continue to contribute, to chess education in Massachusetts. The Education Committee, which took on new leadership in 2013, has become increasingly aware that there are numerous scattered efforts to educate kids all across the state. Some of these involve teaching kids new to chess, such as those who meet in clubs after school or even get exposed to chess in school. Others involve coaching more experienced kids who play in Teams. Whatever the age, instructor's experience, forum, or means, chess education is flourishing across the state in ways that go unknown by most chess players and unacknowledged by the state's chess association. Along these lines, the Expo provides the opportunity for providers of chess education to receive recognition and promotion of their efforts, and for coaches, parents, and kids to learn new ways to educate players. We welcome speakers, teachers, software developers, and other purveyors of chess education to present their efforts at the Expo. The location within the Hyatt Harborside Hotel is the ballroom situated conveniently just down the hall from the Boston Chess Congress, a uniquely prestigious annual USCF-rated tournament held by Contentinal Chess Assocation in Boston. We will post signs in the area of the tournament to invite players to visit the Expo and receive more insight into chess education in MA. You are invited to join us and present your efforts in chess instruction. Feel free to contact the Chair of the Education Exposition, Nicholas P. Sterling, Ph.D., by e-mail at nicholas@xenophon98.com or by phone at 781-733-0849 with any questions or requests to attend. We appreciate all who will come to take advantage of this special occasion. Grand Prix 2014 series takes quick start with the first event on this coming Sunday 1.12 at Waltham Papa Ginos and the second one on 1.19 at Chelmsford Burger King. All players are welcome to start their long way to Grand Prix trophies! Prize winners at the 4th Spiegel Cup Qualifier, held January 4th at the BB&N school in Cambridge, Mass. The tournament was directed by Bob Messenger, Steve Frymer and Nathan Smolensky. Adv. Entries for 4th Qualifier posted: http://goo.gl/eavx4I.